Get your FREE STRATEGY SESSION from our Portland area marketing consultants and uncover the huge profit leaks already sucking thousands from your business. Whether you engage us, another firm, or do it yourself, this FREE session will uncover dozens of ways to immediately squeeze more profit out of your business. No Guesswork! Our Portland area marketing consultants design all components of AMG marketing programs to produce trackable, measurable, and repeatable results. You'll know exactly what every marketing dollar you spend is producing. We'll analyze results and do more of what works and eliminate what doesn't. 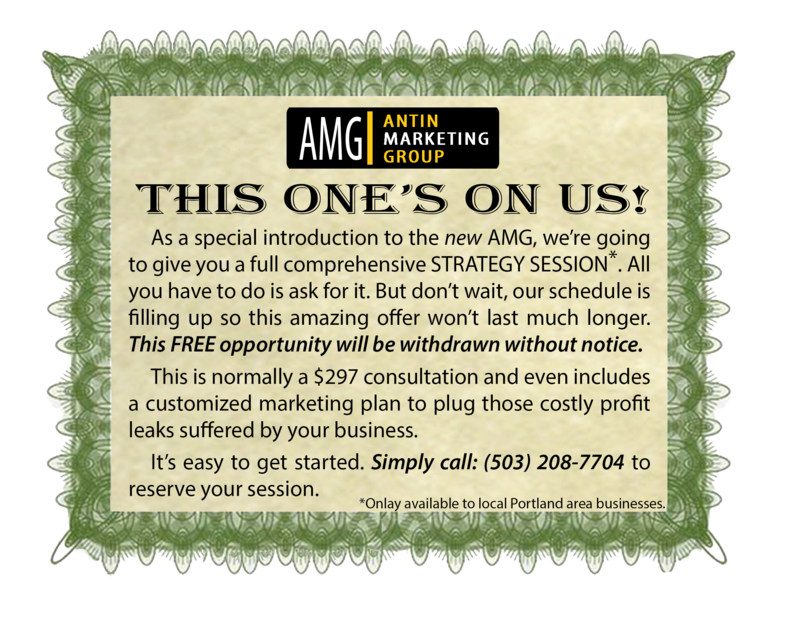 AMG is your Portland marketing consultant whether you want a small stand-alone project or a complete integrated marketing system. Finally, Portland area small businesses can get the advantage of a million-dollar marketing department -- for less than the cost of a single minimum wage employee. We'll help you create a powerful marketing strategy that integrates message, media, and tactics into a well-oiled profit-producing machine. Is your website an effective selling machine or just a pretty "online brochure"? Our complete websites and simple tune-ups generate leads and sales like crazy. The best website in the world won't create sales if nobody sees it. Our SEO experts perform behind the scenes magic that gets you to the top of search rankings. Nothing commands visitors attention like web videos. With our exclusive Component Level Integration Process (CLIP™) you can have custom videos for a fraction of what others pay. Get your FREE STRATEGY SESSION today! Just wait until you see what superior service and true profit-producing marketing can do for your business. "I'm already seeing some of your marketing expertise and strategy payoff. Isn't it great to know you're making a difference? I'm PUMPed and wish I was a real PUMP - pumping in more money for you and me!" "We have received much more than we asked for each and every time we've done business with you. It's so rare to find people who consistently deliver more than they promise. Thank You!." "It suddenly hit me that I was not only getting good ideas from you, I was also getting an education that will be even more valuable than just an idea . I an idea is worth potential millions, what is an education worth?" As a special way of introducing us to you, we’ll buy your strategy session for you. That’s right. We’ll cover the entire cost of the consultation. You pay nothing, and since it’s truly “no obligation,” you’ll owe nothing. And you don’t have to worry about the fine print, because there’s none of that, either. You’ll simply meet with our expert profitability consultant and talk about your business. Then he’ll show you exactly where you’re losing money and exactly what to do to fix it. If you decide to have us deploy our plan for your business, great. We’ll make a little money and you’ll make a lot of money. If you decide you’re not interested in our help (although we’ll be baffled), no problem. We won’t twist your arm. We’ll simply part friends and wish you the very best. The only conditions are that you must reserve your spot now because they're extremely limited and our schedule is starting to fill up fast. Also, this offer is only available to Portland area businesses and will be withdrawn without notice. immediately contact you to schedule your profit producing strategy session. Step 2. About your current marketing? What are your most pressing marketing challenges? Approximately what were your sales last year? The Antin Marketing Group has one and only one purpose--to make our clients money--lots of money! AMG clients benefit from our integrated marketing program employing both proven and powerful offline marketing techniques as well as cutting edge online and social media technologies.